NYC Black and Pink had our first meeting and we had a couple of folks show up despite the snow. We heard from the Queer Detainee Empowerment Project, which you should check out here, and wrote letters to New York folks. We talked about good tips for getting started and how to establish relationships with folks despite the impediments of prison walls. We have been kicking off 2014 with a lot of getting things going again! We had a great January Letterwriting night in South Berkeley – sending a few cards and making 4 new penpal matches! We are planning our February Letterwriting & Valentine’s Card Writing Night as we speak – here is the event invite. It will be in SF on Thursday, Feb 6 from 6-8pm at 938 Valencia St.
We just created a page and a group our local chapter – the page Flying Over Walls – SF Bay Area B&P is for our wider community and support network. And the group – Flying Over Walls – is for folks who want to be more directly involved with our letterwriting, study group or local updates and actions – and who want to make sure they get direct invites. Join, like or both! We’ll post updates about our events, local actions and national B&P stuff on both. And SF Bay Area folks can always email us to connect at flyingoverwalls@gmail.com. Black & Pink-San Diego will join Californians United For a Responsible Budge and Local Collaborating Organizations for a discussion on the Richard J. Donovan Correctional Facility Prison Expansion. They will be joined by Students Against Mass Incarceration (SAMI) at UCSD, New PATH (Parents for Addiction Treatment & Healing), All of Us or None-San Diego, and Committee Against Police Brutality- San Diego. This meeting will entail organizing direct actions. The construction is expected to cost $168.7 million, with an annual operating budget of $5.5 million. The facility will employ about 180 staff. Donovan currently houses more than 3,100 men, even though it was designed to hold only 2,200, according to the most recent data. The state Legislature approved the project in 2012. A similar facility will be built next to Mule Creek State Prison in central California.” It’s anticipated they will ground in San Diego in late March 2014. 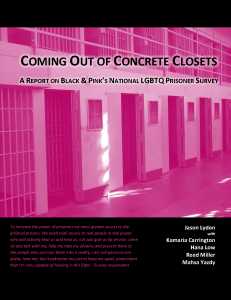 Black and Pink-San Diego will speak about LGBTQ people in the prison system and the school to prison pipeline at the UCSD Socialist Club meeting on the Prison Industrial Complex. We will also be introducing Black & Pink to the attendees to get more people active and involved. 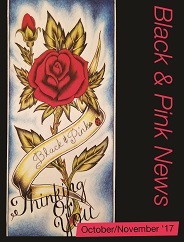 Black and Pink San Diego is making a call to action for pen pals for 14 prisoners currently incarcerated in Richard J. Donovan Correctional Facility (RJD) also known as the “Gender Identity Disorder” Facility. We reached out to the activist community to come together to create postcards to send to Black and Pink members in Donovan prison. There will be food available for a very small donation and these donations will be used to pay for postage for the postcards we create. This benefit event is to raise funds for legal fees for James Messer, a core member of Black & Pink-San Diego, who experienced assault by an San Diego Sheriff’s officer back in September while canvassing for LGBTQ rights with Canvass for a Cause, a local LGBTQ organization. This assault and discrimination was based upon James’ perceived sexual orientation by the officer. This officer abused his authority and displayed homophobic behavior during this encounter in addition to physically assaulting and belittling James. The funds raised from this event will go toward filing fees to ensure that this officer is held accountable for his unacceptable behavior. We had our annual retreat on January 25th-26th. About 20 people showed up on both days, with many new folks, and we got a lot of mail processing done, as well as some important reflection, critique, and strategizing for our future work! 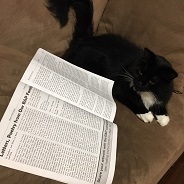 We’ll be coming up with a more specific action plan from the retreat notes at our Leadership Circle meeting on (tentatively) Wednesday, February 12th at 7pm at the City School. On January 31st, we held a fundraiser party for one of our incarcerated family members, Khalid (aka Bayh), in order to help him purchase a typewriter for his legal advocacy work on the inside! This was an electro~queer/trans resisDANCE, with awesome DJs, drag performances, and a board game room for more low key fun. We’re hosting a screening of the “No One is Disposable” talk series between Dean Spade and Reina Gossett on February 7th at 3:30pm at Make Shift! We’re looking forward to seeing folks there to discuss the videos together and how we can incorporate a more critical abolitionist praxis in all the work we do. Mail Processing will be on Sunday, February 2nd, 9th, 16th, and 23rd for the month of February, from 1pm-4pm at Boloco in Copley Square. Volunteers are planning to start regular Mail Processing in Jamaica Plain soon! Free World Family Dinner will tentatively be held on Thursday, February 20th from 7pm-9pm at The City School. Our weekly mail processing meetings are growing strong. We’ve got a solid set of 7+ lovelies that regularly come help out, make food, match pen pals, and respond to mail. To date, we’ve matched 62 pen pals! Due to some major polar vortexing, we had to delay our first Penpal Support meet-up. We’re hosting this event on Feb 3rd for free-world pen pals to meet each other, go over some penpal basics, discuss how this work fits within prison abolition organizing, troubleshoot with each other about issues that might be coming in our letter-writing, brainstorm topics/issues we want to explore in the future, and write our pen pals! Tomorrow we’re having our first retreat with the core organizing team of our chapter. We’ll be reflecting on our work and struggling through some critical questions that have come up for us in these first few months of our work together. This month will also be big for our political education programming! We’re putting together an orientation for new pen pals, hosting a screening of Herman’s House, and launching a 5-session study group exploring the linkages between industrial agriculture and the PIC.